We are an ambitious full symphony orchestra rehearsing in Truro and playing concerts across Cornwall. We play music from the core classical / romantic repertoire combined with occasional modern pieces and works suitable for our annual family concert. We are a player-run organisation with a professional Music Director, Dr Chris Morgan. Chris was trained at the Royal Academy of Music and the Guildhall School of Music & Drama. He lectures in music education at Falmouth University, is an examiner for Trinity and also director of a local arts education organisation (MADE). We have also recently played shorter works by composers including Anderson, Berlioz, Bernstein, Elgar, Mozart, Rossini, Vaughan-Williams, Verdi and Wood. 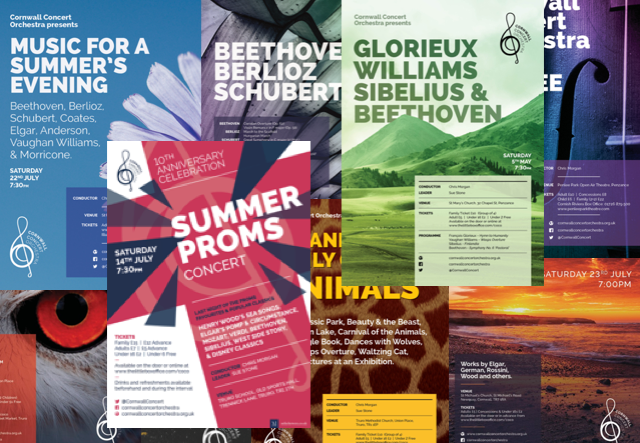 Programmes of future and past concerts can be found on our Concerts pages. Sharing the pleasure of live music making is important to us and we run an annual family concert to try to inspire future generations. We also have an off-shoot winds group called COCO Winds that provides the opportunity for wind players to perform a wider repertoire and also practice skills in small ensemble playing. The orchestra is a registered charity and is managed by a committee of players elected by the full members of the orchestra on an annual basis.